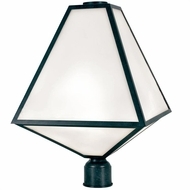 Light Fixtures - Cyrstoma Lighting ~ Best Prices Guaranteed! For over 50 years, Crystorama Lighting has been producing the finest crystal chandeliers in the world. Founded in 1958 by Abraham Kleinberg, Crystorama began as an importer of crystal chandeliers for Bohemia in Northern Czechoslovakia. After their initial success, they searched the world for the finest in crystals, and began their tradition of fine hand-crafted manufacturing of brass, crystal wall sconces and wrought iron chandeliers and fixtures that would make them the unsurpassed leader in North America. Crystorama�s attention to detail, ornate design, and opulent creation make them the leader in timeless fixtures that excel in beauty, elegance, and even extravagance. With the exception of the Chelsea and Matrix lines, which are odes to modern design, Crystorama Lighting array exemplifies Tradition. And they are worth it. 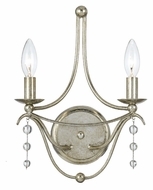 Affordable Crystorama chandeliers offer the best in both style and quality. Beauty and elegance is yours when you choose to buy any of the gorgeous Crystorama chandeliers available. Regardless of your budget, you will be able to afford the regal elegance and splendor you so richly deserve. 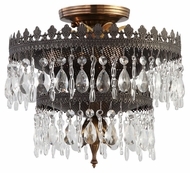 Affordable Lamps offers sale pricing on many styles of Crystorama chandeliers.